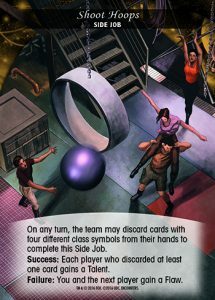 Legendary® Encounters: A Firefly™ Deck Building Game – Side Jobs and Inevitable Cards. Legendary® Encounters has always been about telling a story. That story could be about surviving Aliens™ or outrunning a Predator™, but they are all about the story. 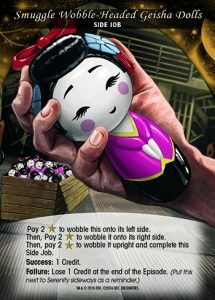 Since Legendary® Encounters: A Firefly™ Deck Building Game is based on a TV show the stories being told are the Episodes from the show. Instead of working through one big enemy deck as in previous Legendary® Encounters games, players will be completing a series of three Episodes. 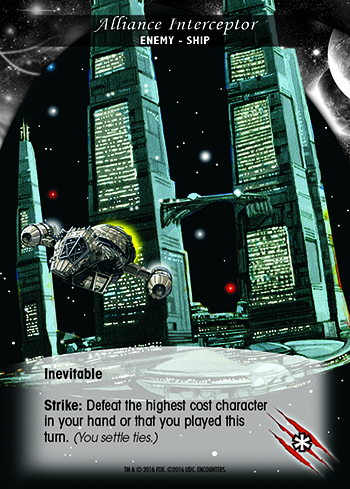 While each Episode will contain the Enemies and Events pertaining to that Episode, players will also be mixing in special cards that represent additional missions that the crew of Serenity will need to handle. These Side Jobs can bring bonuses, like additional Credits, if completed or devastating effects if failed. 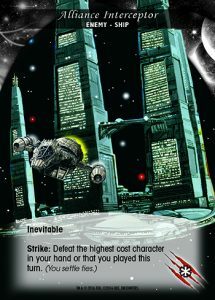 When revealed from the Episode deck, Side Jobs move along the ‘Verse just like an Enemy. Each Side Job will need to be completed before it enters the Combat Zone to gain it’s Success text. 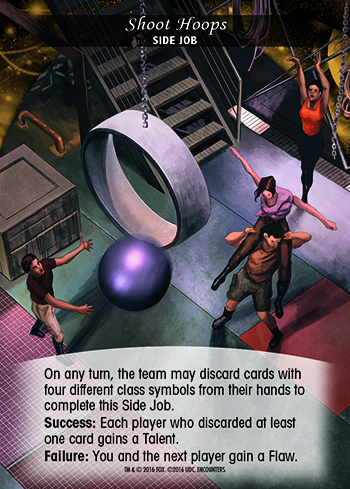 If not completed, players will then follow the Failure text on the card. At the bottom of each Episode deck is an Inevitable Card. This new type of card acts as a time limit for the Episode. There are three different ones, and each one does something mean to the players if it reaches the Combat Zone. The Inevitable Card moves along the ‘Verse during each Episode Phase. Once in the Combat Zone it will strike normally. 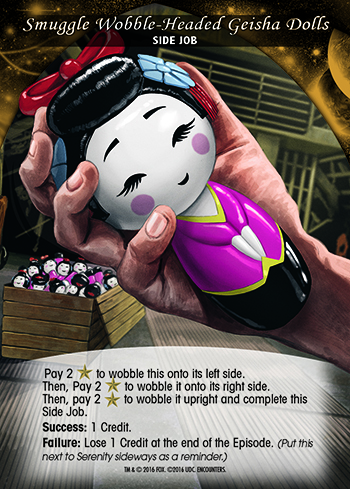 However, once it has gone through a Strike Phase on each player’s turn, the Episode automatically ends. If the players are able to complete the objectives of the Episode, the Episode will end even if the Inevitable Card has not reached the Combat Zone. I have a few questions. First, If the Inevitable Card pushes a face-down card to the Combat Zone and it happens to be Medical Supplies, do you fail the Objective (because you didn’t know it was this card until the reveal in Combat Zone)? Or does the Medical Supplies get relocated to the spot just to the left of the Inevitable Card in the ‘Verse? Another thing, how do you collect the Medical Supplies? There are no Recruit points identified or other means of obtaining this Goal to complete the Objective. The Episode card states that you must “steal” the Medical Supplies, but there are no rules for “steal” as a keyword or anything like that.